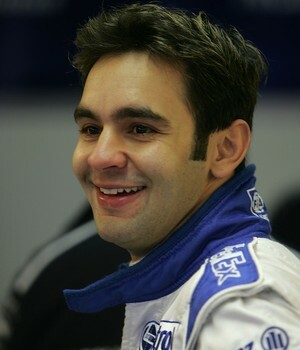 Winning Formula Renault 2.0 UK in 1999, Formula 3 in 2000, 6th in Formula 3000 in 2001, Williams duly spotted Antonio Pizzonia, a Petrobras’ backed Brazillian and appointed him as a one of their test drivers for 2002. “Jungle Boy”, (so named because he hailed from the middle of the Amazon) was hired by Jaguar for 2003. Sadly Jaguar found the disparity in performance between himself and Webber to be “alarming” eventually replacing him with Minardi’s Justin Wilson mid-season. Pizzonia alleged that Jaguar gave Webber a better car, which lead to Webber calling him a liar, and a loser. “the truth is that Antonio was fast in testing but couldn’t repeat it in the races”. It’s an interesting area to investigate, as Wilson fared little better than Antonio, and De La Rosa didn’t come out of his time in the second Jaguar seat smelling of roses either. Never the less, the feeling was that Pizzonia could’t handle the pressure of one lap qualifying which was the main area the Jaguar excelled- being fast over one lap but poor managing it’s tyres, so it was goodbye from Jaguar. Patrick Head who Pizzonia had made a good impression on during his year of testing for Williams couldn’t understand why Pizzonia had struggled so much, and Williams decided to give Pizzonia another chance, re-signing him as test driver for 2004. In 2004, Ralf suffered injuries after a bad shunt at indianopolis. Second Williams test-driver Marc Gene, off the back of his super-sub 5th the previous year, was called up first to fill the vacant Williams seat. After two average performances in an uncompetitive car, Williams decided they had little to lose giving Pizzonia a go as Gene looked unlikely to achieve much, and Williams wasn’t in the hunt. This happily coincided with an improvement in form for Williams. Under no pressure, familiar with the car, he was set fair. Pizzonia drove for 4 races before Ralf Schumacher returned, achieving three 7th places and suffering an unlucky gearbox failure running in 3rd in Belgium. Despite Pizzonia enjoying Petrobras backing and being well esteemed by the team as a good test driver, Nick Heidfeld was given the nod ahead of him, impressing the team with his knowledge and speed during winter testing. Heidfeld then suffered from “headaches” part way through the year off the back of a testing shunt, allowing Pizzonia to fill his seat for the final 5 races of the season, winning a 7th first time out in Italy, before crashing out twice, spinning once, and suffering one tyre failure in the remaining 4 races. For 2006, Williams signed GP2 Champion Nico Rosberg, leaving Pizzonia without a race drive. 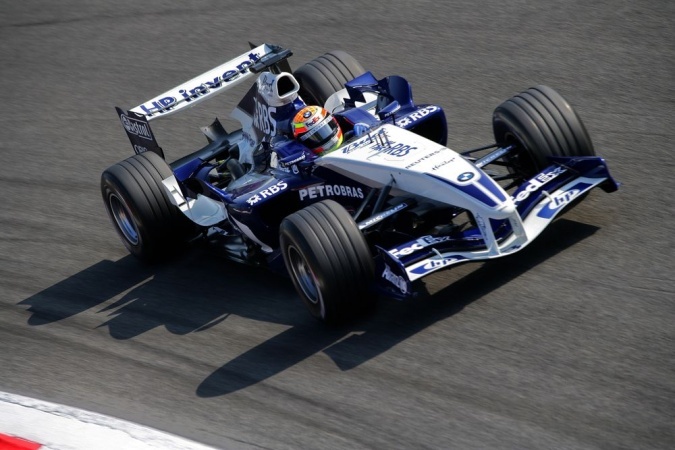 In 2004, Williams were regularly behind Renault, BAR and Ferrari at the start of the season, before modifying the car, abandoning the walrus design and introducing a major redesign by the Hungarian GP, which allowed Pizzonia a better opportunity to shine relative to Gene that season. 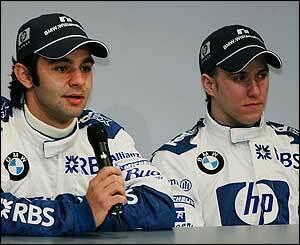 The FW26 was much improved, allowing Ralf to finish a close second in Japan, and Montoya winning in Brazil. In 2005, Willams slipped back- the first car designed exclusively under the technical direction of Sam Michael. Starting the season upper midfield, and contesting for podiums the second half of the year saw a stand-off between BMW and Williams to the detriment of the team’s competitiveness. Webber shone late-on with a strong 4th in Belgium and Japan, but otherwise, the car was mired in the midfield, struggling for points by the time Pizzonia arrived. In his second race for Williams, Pizzonia qualified in 6th, Montoya 7th. The only time he would outqualify a teammate. Benefited from incidents ahead in a safety car affected race. Found himself in 3rd, on for a podium finish ahead of Montoya who had run into problems until his gearbox failed, tragically. Even more tragic, I cannot find any coverage of this race on the ‘net, so a more accurate analysis of this race other than a second hand race report is sadly lacking. Anyone? Qualified 8th, 2 tenths behind Montoya in 2nd (tight field!) Tagged into a spin by Panis at the second chicaine on lap 1 in damp conditions, Pizzonia recovered well cutting through the field, overtaking Webber amongst others to finish 7th, 1 second behind Montoya in 5th. A good note to end on before Ralf Schumacher resumed his seat, even if Ralf did go on to put in a much better showing. His first drive for Williams, and desperate to prove he could handle the pressure, Pizzonia fluffed his qualifying lap ending up 11th, 9 tenths down on Montoya in 2nd. Still, he managed to get into the points on his Williams debut the following day, so it was’t all bad. Following the same pattern as the year before, he drove raggedly in his first qualifying session back, ending up 7 tenths down on Webber to go 16th, having yet to shed his reputation for poor qualifying, under the steely eye of Mario Thiessen. he then backed that up by qualifying 15th, 9 tenths down, in Belgium. Thiessen again, unmoved. From here-on, it was all downhill for poor Pizzonia. In the race, running in 8th and trying to unlap himself from Montoya with a handful of laps to go, he eliminated both of them from the race, earning himself a $8,000 fine. Webber finished 4th. He went on to crash out at the start of the Brazillian GP, coming under increasing pressure from Nico Rosberg, who the team had signed for 2006. Having tested the car for the last two seasons, Pizzonia was familiar with the team, the car, and ended his career with 20 races, so although conditions weren’t ideal being parachuted in mid season in both seasons, that excuse begins to wear thin when you consider all the benefits he was given. It was suggested Rosberg might replace Pizzonia for the last 2 races of the year, but in the end, it was decided this wouldn’t be in Nico Rosberg’s best interests, as Antonio continued to wilt. Things continued to get worse in the following race. Qualified 12th, a whopping 1.4 seconds down on Webber in 7th, he spun off on lap 12, running 11th. Webber went on to finish 4th- rubbing salt in the wounds. Pizzonia had a degree of talent, but his main problem was performing under pressure, both at Jaguar and Williams. I believe he came to Williams shaken by his experiences at Jaguar- not that I’m claiming he wasn’t the cause of his own problems. Following in Gene’s footsteps in 2004 was a nice, pressure free situation where he delivered some regular, ok results, whereas racing against Webber in the middle of a BMW/Williams divorce in 2005 proved too much for him. I think the Williams garage that season was a rough place to be as everyone struggled to accept Williams’ dip in form and were looking for scapegoats. However, whilst Heidfeld raced nip-and-tuck with Webber all season, Pizzonia just couldn’t come close- leaving the distinct impression that WIlliams had made the right decision picking Heidfeld over Pizzonia at the start of the year. I suspect that part of the pressure he succumbed to in 2005 was largely due to his personal issues with Webber. Mark was never slow to put the boot in and I think he really got under Antonio’s skin by regularly destroying him in qualifying. Pizzonia possessed more latent speed than Gene, but looking at his time at Williams on the whole, he didn’t deliver with the same level of professionalism, and his speed rarely, if ever revealed itself relative to Montoya and Webber. In that sense, he reminds me a lot of Bruno Senna, who also managed a string of minor points in a fast car, but never got into his stride, and came under intense pressure from his teammate’s pace in qualifying, leading to errors. He falls awkwardly between nothing-to-lose stand in, and full-time Williams regular. He wasn’t only subbing, he test-drove both cars and was given a period in which to get up to speed. This was a great chance to prove everyone wrong for not choosing him over Heidfeld and the chance went begging- starting off ok before increasingly succumbing to errors. BMW severed their ties with Williams during this period and Pizzonia’s mediocre efforts would definitely not have helped, given that he came to Williams on Head’s recommendation and in place of a German driver.